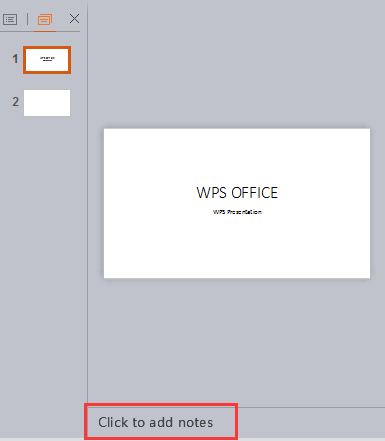 In WPS Presentation, speaker notes are notes added to the slides, it can used as a reference for the presenter. 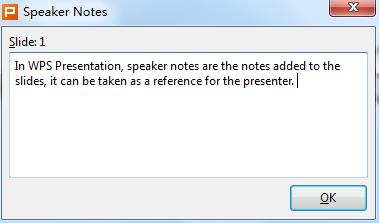 The presenter can view the notes when the presentation projects on the board, while the audience cannot see the notes. The presenter can also print out the notes out for a handy reference. Under each slide, there is an area for you to add notes. Click the notes area to enter speaker notes. 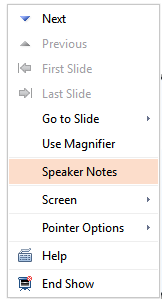 Or you can click the Speaker Notes icon to enter speaker notes. For how to set slideshows during presentation in a speaker mode. Right click the showing slide and select Speaker Notes. Then the Speaker Notes windows will appear in the middle of the computer screen, while the audience cannot see it on the projector. Marketing team in the WPS office located in Mountain View.